FOX Sports Wisconsin will broadcast 78 regular season Milwaukee Bucks games during the 2017-18 season. The regional sports network’s regular season Bucks coverage tips off on Wednesday, Oct. 18, for the Season Opener in Boston. Coverage continues Friday, Oct. 20 as FOX Sports Wisconsin televises the Home Opener against Cleveland and offers a special one-hour edition of “Bucks Live” beginning at 6 p.m. The broadcast team will once again feature Gus Johnson and Marques Johnson, who return to the team for a third season. The duo rejoin long-time Bucks announcers Jim Paschke and Jon McGlocklin, who are entering their 32nd and 42nd years, respectively, of calling Bucks action. 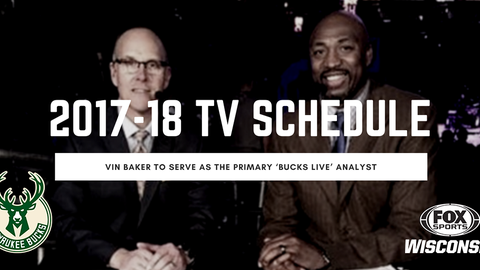 Bucks legend Vin Baker will take on a larger role with the broadcast team, stepping up as the primary analyst for all “Bucks Live” shows throughout season. He’ll be paired with FOX Sports Wisconsin anchor Craig Coshun for pre and postgame shows and team up with newcomer Steve Novak, who joins the team as an occasional contributor. Telly Hughes and Sophia Minnaert complete the FOX Sports Wisconsin team and will handle sideline reporting duties again this season. The 78-game regular season schedule includes 39 telecasts from the BMO Harris Bradley Center and 39 road contests. “Bucks Live” on FOX Sports Wisconsin will air before and after every telecast. FOX Sports Wisconsin’s broadcast schedule also includes two Bucks preseason games, on Wednesday, Oct. 4 and Friday, Oct. 13 when the team hosts the Indiana Pacers and Detroit Pistons. Fans can get ready for the NBA action with the Bucks Season Preview show, which premieres on Wednesday, Oct. 4 at 10:30 p.m. or immediately following the preseason game. All games televised on FOX Sports Wisconsin will be available in high definition, and will be streamed live via FOX Sports GO. FOX Sports GO is currently available for iOS, Apple TV, Android, Android TV, Fire tablets and Fire phones, Roku players and Roku TV, select Windows devices, and online at FOXSportsGO.com. Fans can download the mobile app for free from the iTunes App Store, Google Play, Amazon App Store and Windows Store. Oct. 4 Wednesday Indiana (Preseason) 7 p.m.
Oct. 13 Friday Detroit (Preseason) 7:30 p.m.
Oct. 18 Wednesday at Boston 6:30 p.m.
Oct. 20 Friday Cleveland 6 p.m.
Oct. 21 Saturday Portland 7:30 p.m.
Oct. 23 Monday Charlotte 7 p.m.
Oct. 29 Sunday at Atlanta 2:30 p.m.
Oct. 31 Tuesday Oklahoma City 7 p.m.
Nov. 1 Wednesday at Charlotte 6 p.m.
Nov. 3 Friday at Detroit 6 p.m.
Nov. 7 Tuesday at Cleveland 6 p.m.
Nov. 10 Friday at San Antonio 8 p.m.
Nov. 11 Saturday LA Lakers 7:30 p.m.
Nov. 13 Monday Memphis 7 p.m.
Nov. 15 Wednesday Detroit 7 p.m.
Nov. 18 Saturday at Dallas 8 p.m.
Nov. 20 Monday Washington 7 p.m.
Nov. 22 Wednesday at Phoenix 8 p.m.
Nov. 25 Saturday at Utah 8 p.m.
Nov. 28 Tuesday at Sacramento 9 p.m.
Nov. 30 Thursday at Portland 9 p.m.
Dec. 2 Saturday Sacramento 7:30 p.m.
Dec. 4 Monday at Boston 6:30 p.m.
Dec. 6 Wednesday Detroit 7 p.m.
Dec. 8 Friday Dallas 7 p.m.
Dec. 9 Saturday Utah 7:30 p.m.
Dec. 13 Wednesday at New Orleans 7 p.m.
Dec. 15 Friday Chicago 7 p.m.
Dec. 16 Saturday at Houston 7 p.m.
Dec. 19 Tuesday Cleveland 7 p.m.
Dec. 22 Friday Charlotte 7 p.m.
Dec. 23 Saturday at Charlotte 6 p.m.
Dec. 26 Tuesday Chicago 7 p.m.
Dec. 28 Thursday Minnesota 7 p.m.
Dec. 29 Friday at Oklahoma City 7 p.m.
Jan. 1 Monday at Toronto 6:30 p.m.
Jan. 3 Wednesday Indiana 7 p.m.
Jan. 5 Friday Toronto 7 p.m.
Jan. 6 Saturday at Washington 7 p.m.
Jan. 8 Monday at Indiana 6 p.m.
Jan. 10 Wednesday Orlando 7 p.m.
Jan. 12 Friday Golden State 7 p.m.
Jan. 14 Sunday at Miami 12 p.m.
Jan. 15 Monday at Washington 1 p.m.
Jan. 17 Wednesday Miami 7 p.m.
Jan. 20 Saturday at Philadelphia 6:30 p.m.
Jan. 22 Monday Phoenix 7 p.m.
Jan. 26 Friday Brooklyn 7 p.m.
Jan. 28 Sunday at Chicago 2:30 p.m.
Jan. 29 Monday Philadelphia 7 p.m.
Feb. 1 Thursday at Minnesota 7 p.m.
Feb. 2 Friday New York 7 p.m.
Feb. 4 Sunday at Brooklyn 11 a.m.
Feb. 6 Tuesday at New York 6:30 p.m.
Feb. 9 Friday at Miami 7 p.m.
Feb. 10 Saturday at Orlando 6 p.m.
Feb. 13 Tuesday Atlanta 7 p.m.
Feb. 15 Thursday Denver 7 p.m.
Feb. 23 Friday at Toronto 6:30 p.m.
Feb. 25 Sunday New Orleans 2 p.m.
Feb. 28 Wednesday at Detroit 6 p.m.
March 2 Friday Indiana 7 p.m.
March 4 Sunday Philadelphia 7 p.m.
March 5 Monday at Indiana 6 p.m.
March 7 Wednesday Houston 7 p.m.
March 9 Friday New York 7 p.m.
March 12 Monday at Memphis 7 p.m.
March 14 Wednesday at Orlando 6 p.m.
March 17 Saturday Atlanta 5 p.m.
March 19 Monday at Cleveland 6 p.m.
March 21 Wednesday LA Clippers 7 p.m.
March 23 Friday at Chicago 7 p.m.
March 25 Sunday San Antonio 2:30 p.m.
April 1 Sunday at Denver 7 p.m.
April 5 Thursday Brooklyn 7 p.m.
April 9 Monday Orlando 7 p.m.
April 11 Wednesday at Philadelphia 7 p.m.
All Times Central. Schedule Subject to Change.